The ancient bristlecone pine tree (Pinus longaeva) is considered to be the oldest species of tree, as well as the oldest sexually reproducing, nonclonal lifeform on Earth. 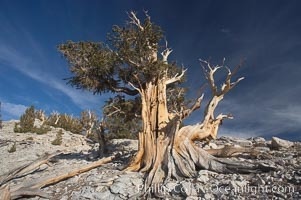 A number of individual bristlecone pine trees are known to exceed 4000 years of age; the "Methuselah tree" in the Schulman grove was estimated to be 4838 years old in 2006. These extraordinarily hardy, gnarled and lonely trees are best seen in the White Mountains of California, where two exemplary groves (Schulman and Patriarch) can be accessed by car. To find other photographs that may interest you, use my Image Search to access over 35,000 images available NOW on this site. Or you can review a Stock List of Subjects, Categories and Locations, but be prepared: it is a long list. Note: the online database offers "thumbnail" and "large" versions of each image and video for your review. For security reasons I must limit the number of "large" versions and videos that each visitor is permitted to view. You have viewed 1846 "large" images and/or videos which exceeds the maximum allowed. You are now able to view "thumbnail-sized" images only. If you are serious about reviewing and licensing my photographs, please contact me and I will immediately remove this restriction, enabling you to continue viewing the "large" versions of my images.